Cheese curds aren’t just for frying. Are you surprised? Innovative restaurants and chefs from all over the world incorporate these squeaky white morsels of goodness into their menus. We’re not just talking the bar and grill down the block, either. Five-star restaurants are making the most of their customers’ love of the curd and including them in the ingredient list for their appetizers, salads, entrees, and yes, even dessert! 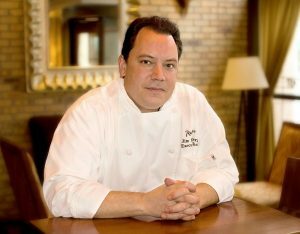 One of the most creative regional cheese curd innovators is Chef Jim Kyndberg, executive chef at FireLake Grill House & Cocktail Bar at the Radisson Blu in Downtown Minneapolis, Minnesota. We’re excited to have him with us at the festival this year, demonstrating his cheese curd mastery, along with some practical tips for cooking with cheese curds. Summer salad with fresh strawberries, rhubarb vinaigrette, and cheese curd crumbles. Grilled steak encrusted with cheese curd crumbles, roasted garlic, fresh basil and sun-dried tomatoes. A deconstructed apple pie, which Chef Jim lovingly refers to as Caramel Apple Cheese Curds. Twin Cites food critic, Jason Derusha, refers to Chef Jim as “the most underrated Chef in the Twin Cities,” and we couldn’t agree more. Chef Jim’s culinary artistry transforms the lowly cheese curd into something spectacular. After sampling a bite, we’re sure you’ll agree. Make a point to join us at the Taste of Ellsworth tasting pavilion during the Cheese Curd Festival to take in the show and sample these amazing creations! You’ll find all the details here.